Entertainment - Page 385 of 387 ..::That Grape Juice.net::.. - Thirsty? Reality TV is big business these days, just ask NeNe Leakes and Kim Kardashian. The pair, who have carved out lucrative careers from their respective shows – Real Housewives of Atlanta and Keeping Up With The Kardashians – were snapped out dining in the A yesterday. Leakes, who infamously declared “I’m very rich, b*tch”, must be keen to show that she’s “new money”, as Kardashian – for all her lack of talent – remains one of Hollywood’s most talked-about entities. Universal Pictures are gearing up for the release their big budget action flick ‘Battleship’. 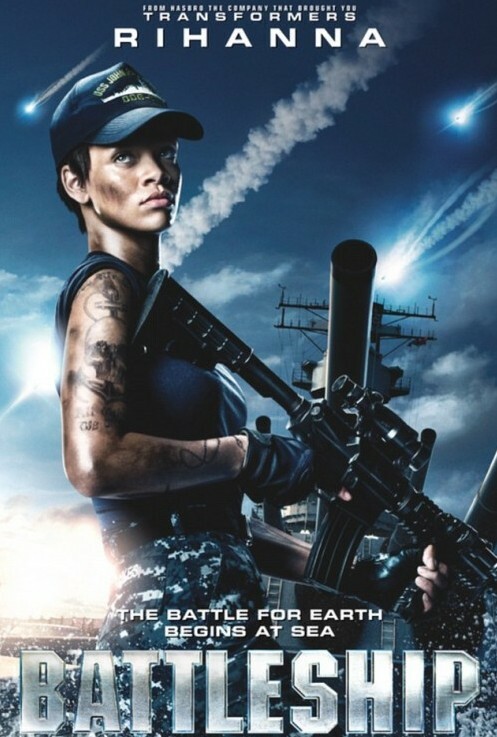 And so as to further whet apetites, the studio have released a new promotional poster featuring actress/model Rihanna – who plays the role of Officer Raike in the movie. Word has is that her role, like her talent, is limited. However, smart business is seeing producers push her to the promotional forefront to ensure a box office hit. ‘Battleship’ hits US theatres on May 18th. Peep the trailer by clicking here. Three of the stars of UPN’s ‘Girlfriends’ were snapped catching up in LA recently. The ladies, Tracee Ellis-Ross, Golden Brooks, and Jill Marie Jones, were all smiles as they chatted it up at an Upscale magazine gala over Oscar weekend. We loved us some ‘Girlfriends’ (as we did ‘The Parkers’, ‘Moesha’, and countless other Urban shows which were axed while on a high). Fingers crossed for a televised (or even big screen) finale, as far too many ends were left untied when the show was brought to an abrupt halt in 2008. The Queen of Shades Patti Lahelle deals her latest hand of laughs with the latest installment of fan favorite ‘Got 2B Real’. Titled ‘Rights, Wrongs, and Receipts’, LaHelle brings back all your favorite divas – Patti Labelle, Dionne Warwick, Beyonce, and Mariah Carey to do a diva quadruple team on ‘Queen of Shoul’ (all puns intended) Aretha Franklin. Press play to get into all the action! Tyler Perry continues to silence his naysayers with success that cannot be denied. The Atlanta-based actor/screen-writer saw his latest effort ‘Good Deeds’ generate $16 Million at the box office on its first weekend. A figure meaty enough to secure the flick, which also stars Gabrielle Union, Phylicia Rashad, and Thandie Newton, the #2 slot. And while it’s worth noting that Perry’s ‘Madea’ movies are renown for opening with $20 Million (double its average production cost), ‘Deeds’ has indeed held up well, given that it doesn’t feature the much-loved matriarch. More power to Tyler. We just hope this success helps facilitate a new, more varied array of movies under his corporate umbrella. The untimely passing of Whitney Houston has seen much of the singer’s hits rocket into to the upper echelon of the charts. However, for as much as we love Houston’s classic cuts, we’re also keen ardent appreciators of her latter material. Case, point, 2003’s ‘Try It On My Own’. Lifted from the late star’s 5th studio album ‘Just Whitney’, the song and its accompanying were initially hailed upon release – with ample reason too. Vocally, the track would become one of the last recorded showcases of ‘The Voice’ (see: potent, textured, and effortless); while the visual underlined the track’s compelling lyrics. Lyrics which relayed a narrative of going it alone after years of corporate scaffolding. All rather fascinating stuff given that the song’s housing album was the first and only to not feature creative input from Houston’s long-time mentor Clive Davis. Indeed, it was then-head of Arista LA Reid who took creative helm of the project. And yet it was this juxtaposition of Whitney being in control versus a reality which saw her life spinning out of it which sunk the song and the album moreover. The media (and the masses they influence) were simply not entertaining any such “in-control” notion. Indeed, it seemed the more Whitney proclaimed it, the less people believed. As such, ‘Try’ peaked at #84 on the Billboard Hot 100, while ‘Just Whitney’ peaked at #9 on the US album tally. Still, neither can take away from the “stellar” that was the Babyface produced song and the ‘Just Whitney’ album moreover. Both earn a well-deserved spot next to the legend’s best material. Commercially successful or not. Continuing along the promo trail for new movie ‘Good Deeds’, Tyler Perry stopped by E!’s ‘Chelsea Lately’ this week. And with host Chelsea Handler being who she is, the chat -predictably-ventured into territory beyond ‘Deeds’, namely Perry’s next movie ‘The Marriage Councellor’ – which stars Kim Kardashian. A controversial casting which, according to the ‘Madea’ star, saw him at the receiving end of stinging critisism. 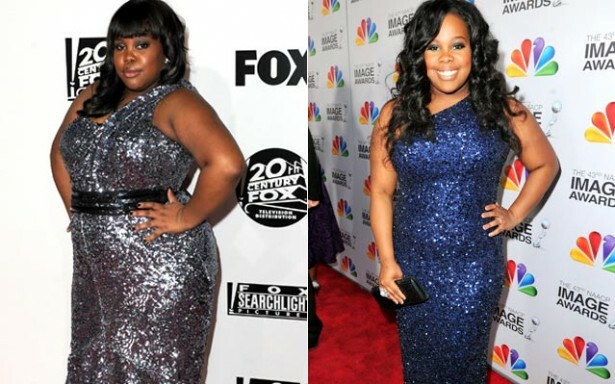 Cop a gander at Glee star Amber Riley! Seven months of sticking to a new diet and exercise plan have seen the budding diva hit a weight loss milestone: “I dropped two dress sizes!” she tells the publication. A cheque her recent appearance at the NAACP Awards 2012 can certainly cash (as seen above). Speaking on her new physique, Riley – who plays Mercedes Jones on the Fox show, said “I’m a lot more comfortable in dresses, especially gowns”. Despite the loss of pounds, Riley asserts “I’ve always been comfortable with my size. I just decided it was time to get healthy.” And wear healthy well she does. Stunner Gabrielle Union stopped by the ‘Late Show With Jimmy Fallon’ last night to plug her latest movie ‘Good Deeds’. As well as talking up the Tyler Perry flick, the 39 year old also dished on her relationship with Dwayne Wade, and playing basketball herself with Ice Cube. The runway success of Bravo’s ‘Real Housewives of Atlanta’ has seen much of the cast try their hand other ventures. However, for Kandi Burrus the “reality” pie is one she clearly has a sweet-tooth for, as she is gearing up for the premiere of her spin-off series ‘The Kandi Factory’. Set to debut on March 4th, the show will see the former Xscape singer give two protégés, with no music industry experience, the chance to fly to Atlanta where she will write an original song for each based on their personal experiences. Thereafter, the amateurs will be coached her team of “experts” – comprised of a producer, choreographer and stylist – to master the key elements that make a pop star. The winner will see their song and accompanying video produced and released by The Kandi Factory. A reach? Perhaps. However, we applaud Ms. Burrus’ hustle. More power to her. Tracee Ellis Ross may have found her footing with new BET show ‘Reed Between The Lines’, but the actress saw her world rocked when the show she rose to fame on, ‘Girlfriends’, was unceremoniously dropped by The CW. Still a ratings winner at the time of its axe, the series was seen by many as a victim of an “Urban” cull by the network. Check out Ross (daughter of singer Diana) discuss the show’s demise at a recent conference in London. Season 5 of The Game kicks off tonight on BET! And by the looks of the cast’s promo run, the network are leaving no stone unturned in their quest to make this the show’s biggest series yet. Case, point, their visit to The Wendy Williams Show this week, where Tia Mowry, Pooch Hall, and co, dished on what we can expect from the sitcom this go round, as well as the whereabouts of favourite Brittany Daniel (who played Kelly Pitts). Peep the action above and below….